Two-stranded plying balls of spindle-spun yarn and a phang-in-progress, hanging in a Ladakhi home in 2007. I say that tongue-in-cheek, because I am very far removed from what might be considered a production spinner, or weaver, or maker of anything. But the last few days have involved making things, and doing it more quickly than usual. For example, I spun a whole skein of coils in one day, in preparation for teaching a textured handspun class. That was pretty quick, but it's bulky, and was done on the wheel, so a skein in a day is not surprising. The other project I'm working on, though, is pushing limits. In the post "two spindles full", I traced the slow progress of Romney spun from hand-teased locks on Peruvian spindles. Those two spindles got plied, and made a nice, hefty ball of weaving yarn. Full spindle of plied yarn, at the moment I finished. I was inspired to make a warp in mostly grey, using this nice Romney as a ground. It would be an Andean pickup piece, with bands of pattern in the center and on the sides. Accordingly, I starting winding a warp, picking how many rounds to use for the plain fields based on previous weavings. I wound 20 rounds for the border, then a pattern band, then 50 rounds, then the center pattern band, then ...29 rounds, and the yarn was finished. Hmm. Given the limitation of my warping pegs, I'd already taken the first half off and laid it aside, so there the 29 rounds sat, warped and taking up space, waiting for 41 more rounds' worth of yarn. I got to work spinning, and spent most of the next day spinning what looked like a sufficient amount on one spindle, then on the second one. Plied them last night and wound on... anther 20 rounds. So 49 rounds sit there, awaiting the rest of the warp. Many lessons rolled into one, here. I never weighed or measured the original yarn, so I had no idea how much more I would need - it's all just eyeballing, and clearly my eyeballing is not well developed in this area. Another lesson is that I should probably just keep spinning, making more than seems necessary, because the only problem then would be having more than enough. Another lesson has to do with this yarn not necessarily being ideal for backstrap weaving. I was enthusiastic about spinning it from the lock, and continue to enjoy that, but the crimp and fluff of this Romney make it challenging to spin with perfect smoothness. I will be grappling with this lesson as I weave, but I'm in that too-deep-to-back-out situation at this point, and I'm going to follow through. As I consider the fact that I'm spinning in a few days the same amount I spun over a year or more, and mentally struggle with the prospect of spending another day or two devoted exclusively to spinning this one type of yarn, it makes me laugh to come across the photos of Ladakhi phangs and plying balls in my archive. This is what production spinning really is - the same thing, again and again until there is more than enough. Ladakhi plying balls, with phang spindles, sitting out on the roof of the house, 2007. Now that's two spindles full. Ladakh, 2007. 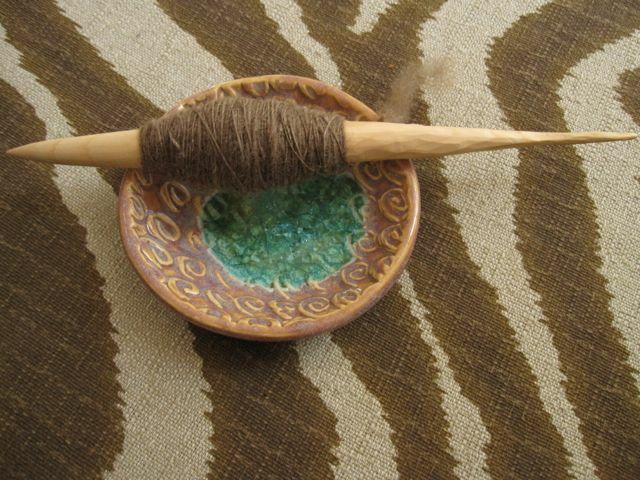 I'm offering a spindle spinning class in May, through the Port Townsend School of the Arts. It's a slow-paced, deliberately discursive path. I hope people will join me. I also have things for sale on Etsy now - Tracy Hudson FIBERWORK. Much excitement! I've only been doing this for three days, but it's been so gratifying. I discovered that Jude Hill has made certain workshops available for free through her website, and I began to explore Whispering Color. The first day I listened and pulled out fabrics, and ended up with a very quiet, neutral arrangement. The phrase that stuck with me was "a reflection of the day." The day had been gray, and dull, inside my head as well as outside, and this exploration of neutral barely-colors was a good reflection. The second day, I worked more with the spectrum of color, and seeing it against different grounds, finally pleased with one that seemed like light in the forest, making the colors sing clearly their different tones, the way they would if you saw them in nature. I've made a point of actually sewing the sample each day, which takes it to a level of commitment. It makes me exercise my stitching skills, and the pieces look different when sewn. I'm also thinking about the color of the thread, since it shows just a bit. Thinking about color in the form of cloth has allowed me to reacquaint myself with my fabric stash, which is now gathered together in a new space. The timing is perfect for exploring the options. Digging through the stash, I came up with a palette to match one that I recently painted in watercolor: the colors of Beckett Point, with its driftwood, grasses, evergreens, lichens, and weathered boats and houses. Moving between paint and fabric could be very fun.... thinking about that, and meanwhile just enjoying this page of color swatches. The third day was about colors in between, making for an even more dynamic rummaging and choosing. The colors jumped at me, playing and shifting and urging me to follow along. Jude talks about personalizing the color wheel, using what you like, and paying attention to your whims. It's a color journal, really, and such a valuable experience. I have to go away from this for a few weeks, but I know I'll be back for more. I'm leaving everything as is, and already there are more ideas brewing. The workshops are offered for free, but there is the option to donate, which I've done - such a generous offering from a great mentor! It's wonderful to hear her voice, and the way she opens up her own process is just that: an opening, a door one can walk through. Very grateful! The strip of supplementary warp is a long band, wound into a roll, and Heidi, the shop owner, informed me "It's a yurt band - not for sale." She has her own textile collection interspersed among the fibers and yarns throughout the shop, and I had to spend a long time just taking it all in. Anyway, the yurt band (sitting on top of a beautiful Bolivian weaving.... sigh! ), was fascinating to me because it is so similar to the Bedouin sh'jarah method of warp substitution. The floats are loose on the back, in the same way. This is the technique I was working on earlier in the year, with aspirations of weaving a more complex design someday. The bands were given to Heidi by a friend, and she had no information on their origin. So I'm left to wonder, and keep looking at my photos of the beautiful weaving. Meanwhile, I now have my own shipment from Qatar to contend with, so there are plenty of textiles to ponder at home. Need to figure out where all these are going to live. I've been noticing the harmony between what I'm seeing outdoors and indoors these days. The first two have been lacking in my life lately, although texture has continuously been there. And I noticed texture was one of the most striking things about being back in a forest. The view below was beneath my feet as I sat on a rock. The river itself is multi-textural, rushing through the rocks and eddying near the shore. This river, the Elwha, has a remarkable story that is in dramatic progress, with imminent and unpredictable change in its future. In fact, the hike we did may be inaccessible once the waters rise, so it was a privilege to see the place as it is now. But mostly we were in the forest. It stuns me how quickly one is in the forest on the Olympic Peninsula. 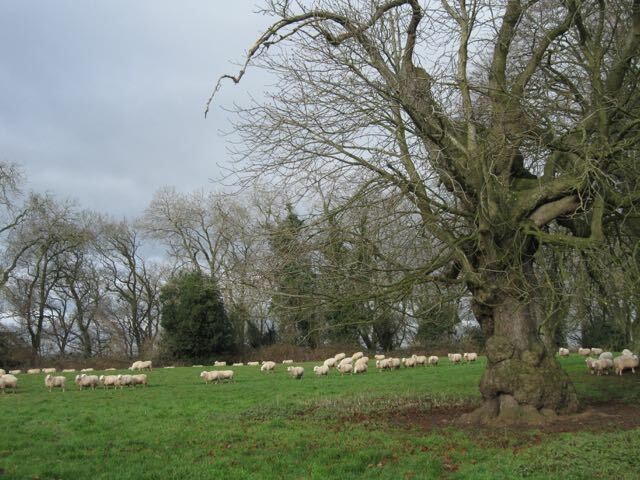 Every tree has a different texture, from its own bark and from all the licheny, mossy, fungal growths happening. There's not much to say when dwelling in this sort of world, but I wanted to share a few images, as well as the Elwha story. Rather dusty these days, as the accumulation on the windowsill shows. View from our window when we moved in, 8 years ago. View from the same window a few months ago. Grateful for the plants and trees! We are also now picking up sticks and moving on. Although we have a lot more to carry than the doves, and we spent quite a while here, it ultimately feels like this was simply the gesture of a nest. There is something transient in the air in Doha, heightened by the dust, wind, and endless construction. Aspire zone, where my fitness club is. The stadium is being modified for 2022. Some of the last sticks that had to be packed up were the pieces of my backstrap loom. I did some last-minute weaving, to finish up a larger piece, and then dismantled my setup. I've been using this dining table to tie up to for as long as I've been backstrap weaving, so it will be another big change to find a new system. Weaving in Doha with a homemade reed and my typical tie-up. Plain weave cotton. Commercial warp and part of weft - the light colored weft yarn is handspun. This weaving will be finished, and a new tie-up found, when the real nesting begins. The treasures I found on my last trip to Jordan cost only 1 JD each, and had the theme of traditional dress. First, a brilliant subversion of the Barbie aesthetic, hand crafted by an anonymous woman in Madaba. I saw this display on the street, and was completely enthralled. As I closely examined the whole array, a man told me they were one dinar, and that his wife made the clothing. I can still look at this photo for ages: such well-dressed women! The various cross stitch, brocade, and print fabrics are so well selected, and the combination of semi-veiled, fully veiled and headband wear makes it look like a parade of actual Jordanian women. And even the occasional man, with a drawn-on beard! Some of them have black eyes, made with the same pen as the men's beards, and others are left blue-eyed. It's the variety that gets me, and makes such a strong and positive point. The Madaba woman is not simply saying that women should be "modest" or "covered", or that they should all look the same, but saying rather, "Look how lovely we are, in the rich mix of clothing that shows we are Jordanian!" I only bought the one shown here, after much agonizing over colors and styles. Probably should have gotten at least half a dozen, but sometimes reason does prevail over my collecting urges, supported this time by an imminent international move. I told the man to tell his wife "Mashallah!" - Well done! It's striking to compare the beauty of these dolls with the images they were originally meant to represent, which I don't see as "beauty" at all, merely convention. Keeping them in the original boxes makes the subversion complete. The base dolls are made in China - which information was also blacked out with a marker. I'm definitely a biased observer, given my love for handcrafted clothing and textiles, but to me it's quite obvious which presentation celebrates female identity and beauty more effectively. One has only to imagine all the dolls looking identical, prior to their transformation. I should also mention that one sees colorful, embroidered robes for sale in the shops, and women really do wear them. Jordanian women are quite visible, active, and professional around town, while maintaining a high level of modesty and coverage with their dress. The second treasure of this trip was a set of postcards, two for 1 JD, from the Shrine of the Beheading of John the Baptist at Madaba (I know - whoa.) The church is an active one, with evidence of the Orthodox Easter celebrations still scattered around (I was there in April,) and in addition to the interesting architecture and historical aspects of the building, they had a collection of old photographs on display. The prints showed Christians from Kerak and other neighboring areas, who came to Madaba to consolidate the Christian community, around 1900. Of interest to me was, of course, how they dressed. I noticed the girls were wearing oversized dresses with long, pointed sleeve openings. This was particularly evident on the smaller girls. You can see that the ends of her sleeves hang in front, and that the dress is bunched up below the waist. This may be less obvious if one has never seen a traditional oversized dress, but I immediately thought of the three meter dress I'd seen at Tiraz, during the textile conference last year. We had all been fascinated by this dress, and wondering how it was worn, and had found some references in books that showed the belting, blousing of fully half of the length of the dress over the belt, and wrapping or tying of sleeves around, behind, etc. Then someone found an excellent documentary video in Widad Kawar's archives, with a woman demonstrating the belting and arrangement of the extra large dress. This made me happy to see real examples of such a garment from the early 20th century, and especially happy that the church sold postcards of some of the old photos. Documentation of the large dress in a Danish book - sorry I did not save the title of the book. During our wanderings in the beautiful valley of the River Wye, we were treated to an inside view of an old stone chapel. England is full of small, old churches, but Brockhampton is special because of its tapestries, designed by Edward Burne-Jones and woven in the William Morris studios. The altar cloth is also covered with elaborate stitching, including gold thread. This tapestry was nicely illuminated by the sunlight coming from the side window. Indirect light, and a glass cover over the work - possibly protected against light damage, says the conservator mind. These were mentioned in the tourist maps of the Wye Valley sights, but the church also contains lesser known textile delights. Each pew has a stack of little hymnals, no more than five inches long, and each hymnal has a hand-embroidered linen cover depicting local flora, with the name of the plant and "Brockhampton Church" written with thread. I was so charmed by these hymnal covers, so understated and uniform, but with such loving detail work in the realistic images. The intimate sense of place conveyed by this creative act, giving to the local church and parishioners by illustrating the local flowering plants: so tender and unexpected. Our English friend said it's common for the women of the parish to decorate the church in this way - they had also embroidered covers for the pew cushions, with larger botanical motifs and written memorial messages. Trying to identify the local breed of sheep... Romney? Or Cheviot? I could not get any closer than this without startling them all into a run. At the annual Dhow Festival in Doha, we are treated to demonstrations of some of the old traditions relating to boats. One never knows what one will see, and this year I stumbled onto the festival quite by chance. I stopped to watch the man who was weaving baskets from some part of the palm tree, stiff flat sticks, in a way that formed 6 pointed stars at the joins. Having recently tried willow basket weaving for the first time, I had an increased appreciation of basketry methods, and watched attentively as he tensioned the strips against one another. The men could see my interest, and they showed me the finished trap, similar to this one, with a tapered entry point for the fish - although this one had the entry point in the side wall of the basket, with a back door that could be latched and opened to remove the fish. A different style of wide open basket was also made for carrying fish. The lighting was not great, so I didn't try to take many pictures. After I had examined and admired for a bit, the weaver asked me if I knew anything about fish. While I thought I was observing and talking to a weaver, I was actually talking to a fisherman. This struck me because it demonstrated, once again, how artificially separate craft skills are to those of us who learn them outside of any context of traditional use. More dhows, with the Museum of Islamic Art in the background, and part of the Doha skyline at left. The other day I saw a robin. The other day, I saw the sweetest little bird. Small and smooth, plain brown for the most part, but with a vibrant, deep orange throat and chest, and white on the belly. The brilliant red-orange color forms a bib that comes to two scalloped points. I observed these details closely, so that I could look up what kind of bird it was. I saw it several times, perching near my windows, and was stopped in my tracks by the lovely trilling song while walking outside. Although the most familiar bird name since childhood, culturally, might be "robin" - songs, poems, and nursery tales bringing Robin Redbreast to early prominence as a concept, I had never been very attracted to the robins I saw around me. A large, assertive ground bird with mottled plumage around his head, white flecks breaking up the smoothness of the color, the robin was interesting to watch, poking in the ground for worms. But I never considered them pretty or charming, and I was certainly never arrested by any song. Call me prejudiced, but little, round birds with big eyes and tiny beaks are just way cuter. Our American robin, by contrast, is almost roguish, not the kind of bird that attracts a child. So imagine how mystified I was to find that the charming wee bird with the striking orange bib is a "robin." Otherwise known as the European robin, but for all intents and purposes that is the English name for this bird. Which means that all the nursery rhyme delight in robins that we inherited from Britain is addressing a totally different bird. And so I can't say "the other day I saw a robin," because at that time, seeing a robin is not what I was doing. I was seeing a little, unknown but charming bird, and if anyone had asked me, "Did you see that robin?" I would probably have said no. Why does it matter? Because so often we make assumptions that others know what we're talking about, or that our version of acquired understanding is the truth. It is something I often think about and observe, and to learn that I have made it to middle age without knowing what a robin is to an English person struck me as a remarkable demonstration of how removed we can be from even those cultures that seem most closely related to our own. A good-natured mini-rant, more of a pet peeve, really just a way to show off a rug or two. Soumak rug, purchased from Dagestani pilgrims on their way to Mecca, in Damascus in 2010. The pilgrims bring a large load of rugs to sell, in order to finance their pilgrimage. A friend was in Damascus at the time, and offered to get a rug for me. I get impatient with rug dealers' penchant for pointing out the 'mistakes' in a handwoven rug, and explaining that there is "always one mistake, because only God is perfect," or some such explanation. This story is told often, and not only for handwoven rugs. I heard a similar note about Japanese ceramics (only the Emperor's bowl is perfect.) And I don't doubt that some people, somewhere, at some time, have practiced adding a deliberate anomaly to their work, as a sign of respect for some entity, or as a demonstration of humility, or to avoid the evil eye. That's perfectly plausible. But this endless game of finding "the mistake" in a rug, which is repeated by the owners of the rug at every opportunity, is tiresome because it misses the point. And the point is that the rug is handmade, of course it's not perfect! The rugs I own have not one, but many delightful variations of shape here and there, and I see them as signs of the humans who wove them, making choices as necessary and weaving along without too much concern for perfection. I don't believe that they considered picking it out and making it 'perfect', but decided not to because of some traditional practice. I believe they didn't much care, as long as the whole thing worked and looked harmonious. The variations on motif shapes and placement are a view into the mind of the weaver. They not only attest to the handworked nature of the rug, but show the thinking, responsive person who put him or herself into the piece. If something is perfectly executed, we can perhaps admire the skill, but we don't connect with the humanity of the craftsperson quite so easily as with a more improvised work. This is the internal grid pattern of the middle section - the most regular part of the whole thing. Latest Andean pickup handwoven band, made with handspun yarns. To clarify, because some may say that spinning and weaving with extremely fine, strong yarn is not about 'knowing' but rather the acquisition of skill: I see the acquisition of traditional skills as a way of knowing, and my own work shows me the extent to which I live and learn outside of any particular way. My efforts are self-motivated, not integral to my culture or the expectations of my community, and I have only for very brief moments learned from anyone in person. A lesson in Lao supplementary weft weaving at Ock Pop Tok, Luang Prabang. So in this sense, I really know almost nothing, set against any given way of knowing. Because a way of knowing is an immersion, a living-through, an acquisition of technique that goes beyond technique to the understanding of how it fits in with one's role in life, to one's purpose as a human being. This is the ineffable quality one sees or senses in the master's work, the craftsperson who is so completely at home with the work that every stage of the process looks like fulfillment. It is also the quality of a living textile making tradition, that each skill and facet of knowledge is essential and integral to the person and the community. It is a belonging, and the reason I'm talking about it is because I feel the lack and the longing for it in my own explorations. I have the freedom of the unattached. Not locked into any tradition or community, I can play the dilettante, exploring Bedouin ground loom weaving here, and Katu foot-tensioned weaving there, but I miss the sense of home, the grounded identity that comes with being a weaver in a weaving culture, and the connection of my community with my work. My Tibetan style pile weaving in progress, at the Tibetan Handicrafts Cooperative, McLeod Ganj. The state of not knowing is quite welcome to me, because it means I am open to learn. The first time I sat down as a weaving student, in a Tibetan handicrafts cooperative workshop in McLeod Ganj above Dharamsala, India, my teacher and I had only a few words in common, in Hindi. I imitated the Tibetan way of looping a double strand of wool yarn around the metal bar and the cotton warp threads on the vertical loom, and she would watch me and periodically say, "Aisa nahi... Aisa," which means "Not like that.... Like this." Often I would feel the explanations rise to my mind, the reasons why I was doing it 'like that,' because I thought blah-blah-blah..... Since we couldn't speak, I could never explain, and it was just as well, because I was stripped of my American defensiveness and the wish to prove that I understood, and could only ever prove it by doing it right. So when I experience the truth of how little I know, it means that I'm fit to learn, and it often means I'm actually faced with a teacher, in which case it is even more welcome. Acknowledging my own ignorance is a way of appreciating the wealth of knowledge carried by so many textile cultures, and it is this ignorance that motivates me. I don't weave and spin in order to keep creating something I know, but in order to keep learning about what I don't know. As long as I have the freedom that comes with technical ignorance and cultural homelessness, I should exercise that freedom by learning as much as I can, anywhere I can find it. Sometimes it feels that not much is happening, but still there is a lot going on. Just on a small scale. I'm preparing to travel, and trying to finish up (or start) a few things before I go. It seems that I always have fiber-project deadlines in the days before any trip. There is quilting in progress, a quick stitching up for a new small person I will meet. And there is spinning, or more accurately, plying, of handspun cotton with handspun silk, then with itself, then cabled with the first 2-ply. Making a yarn strong enough to incorporate with some cotton/acrylic for a WIP. Also in the middle of transforming handspun into a very warm scarf/cowl. But this does not need to be finished this week, so it's resting in a basket. Then there's the random casting on, unrelated to anything that Needs to Be Done. I love this stage of a toe-up sock. Like a little talisman on three needles, it holds so much potential - and it grows so fast at this stage, with all the anticipation of a new beginning. It's good to have socks on the needles again. Despite all the studying I've done of Andean pickup weaving, and my own attempts to learn it, I had never seen real Chinchero weaving in person, with the exception of the wee tanka ch'oro jakima strip sent to me by Laverne Waddington. Finally, at the Textile Society of America Symposium in Los Angeles, I found CTTC represented by ClothRoads, and could get my hands on pieces woven in Peru. This small bag is from Chinchero, and is being compared to my own recent weaving. It reminds me of the childish taunt "Shows what you know!" I say this with good humor, but it's decidedly humbling to see my best effort to date, made with handspun that I'm relatively proud of, next to the real deal. The S curve, or kutij, in the middle of the Chinchero piece, woven by Martha Quispe Huamán, is the same number of warps as the curves in mine. It's mind-boggling, really. Look at the size of the yarn ends, all 2-ply handspun. Mine look monstrous! And we're not even going to talk about the beautiful, intricate ñawi awapa border, which is simply par for the course in Chinchero weaving. I have not learned that yet - I'm still in backstrap pre-school. Because there's no one to tell me I can't do it like that. Yarn spun from old clothing? Warped as singles and woven clamped to my kitchen counter? Why not! Spinning with a different handmade spindle - made by Janet and modified by me. Using a new bowl from my friend Cathy Broski's kiln. 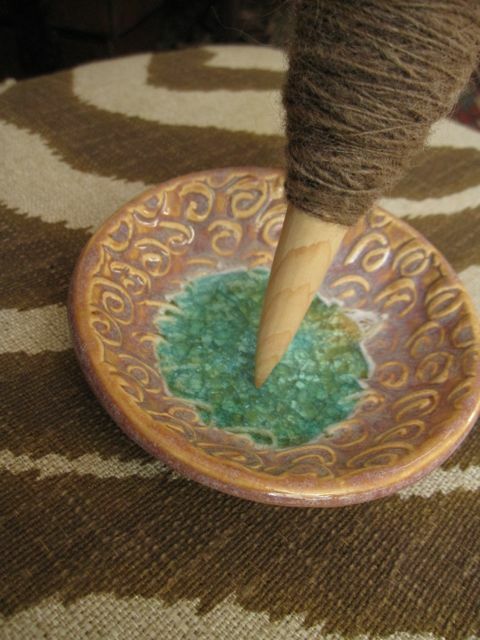 Her jewel bowls are excellent for supported spinning.